CHICAGO TRIBUNE TV WEEK. September 15-21 1962. 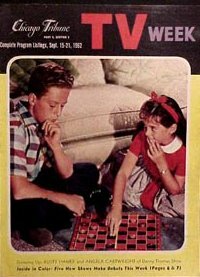 Angela Cartwright and Rusty Hamer of the Danny Thomas Show on the cover. A very high quality TV newspaper supplement. The cover with bold unfaded graphics, absolutely no wear and nice gloss. Pulled directly out of stacks of unread newspapers, this item is truly unread, unused. Contains 23 pages, and measures 11" x 8 1/4".